I can’t write a full review of this game because I have no intention of finishing it. 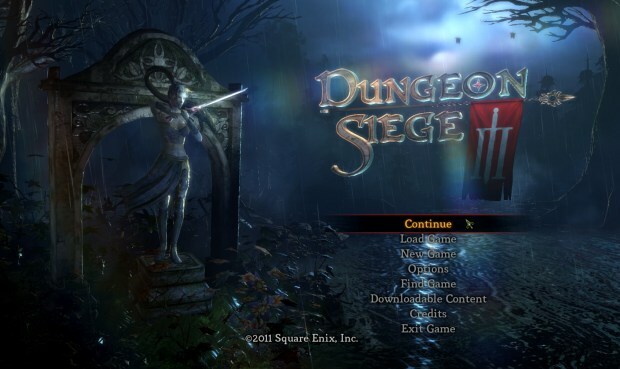 I am a huge fan of Dungeon Siege and its sequel, and of the hack ‘n slash genre in general, but I felt it to be my duty to warn you guys away from Dungeon Siege 3 right now, in case you were thinking about picking it up. I’ve played a little over two hours of the PC version of the game, which version (or port rather), it should be mentioned, was clearly an afterthought. I’m just going to list the things I jotted down during those first two hours. Having to navigate by holding the right mouse button is silly to begin with. Being able to tell your guy where to go and then go click an ability or potion is an important part of top-down slashers like this. If they’d come up with something new or better, that’d be one thing. This just doesn’t control well, plain and simple. The mouse buttons tend to get “stuck” down, and sometimes your character will simply continue running or the camera keep panning, even after you’ve interrupted your movement with an ability or attack. This happens randomly but frequently. There is no customization of keys, at all. The in-game guide doesn’t mention what keys do what, either. It says you can transmute items into gold, but I had to check the manual to find out what key that was. Apparently they’re fixing this. How could they ship without it? Targeting seems arbitrary. 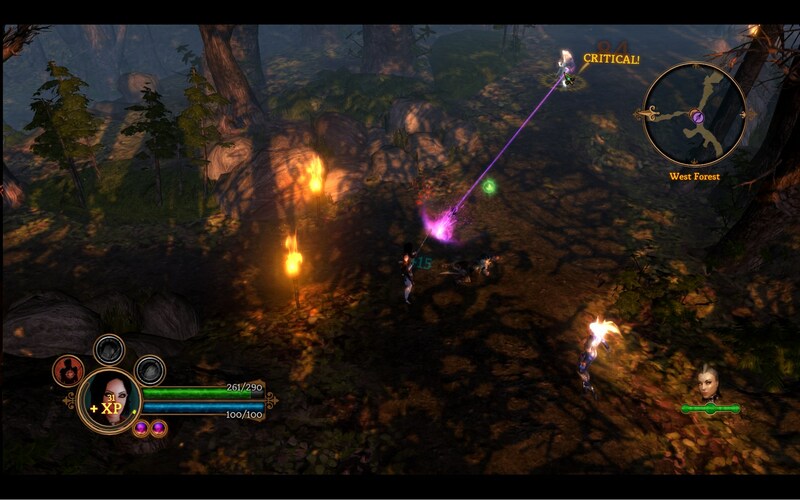 Sometimes I would shoot at the guy I had my cursor over, and sometimes the targeted enemy would just be another one. One time I couldn’t even see the enemy being targeted, and couldn’t for the life of me target the one whaling on me from two feet away. My character just kept on shooting this door, though I was clicking furiously on my attacker. I really don’t know how I managed to get her to switch finally. I experienced a sort of lag time after certain actions during which the game discards your input. After activating a dialogue or door, for instance, I found it wouldn’t let me start holding the mouse button down to run until a half a second passed. It doesn’t “stack” your inputs, either, so if you attack and then quickly hit “1” for your special attack after, the special attack will not fire when you finish that attack. You have to wait until that attack animation is over to activate it. Attacking speed is somewhat irregular, which is realistic I guess, but troublesome for timing things like running and special attacks. When is this animation done? When can I play? You have to click every time you want to attack. No, you can’t hold it down, and no, you can’t just order your guy to attack an enemy. The AI is very much “run towards you and attack.” Perhaps later in the game there are more sophisticated enemies, but I’m not in a mood to be charitable. The monsters and guys I met just ran in a bunch toward me, giving me ample time to step back once they started their long attack animations (hraaaaaaah!). Occasionally one would get stuck inside a wall or door, which could be trouble if you couldn’t reach them, since you can’t save when there are enemies around, even if you can’t see them. Ranged guys stood there and took bullets like champs. Occasional invisible walls seemed to bar my progress when trying to navigate around enemies. One boss seemed to have glass shields extending several feet to his right and left, which rather limited my movement options when he was pushing me against a wall. I had limited experience with a companion, but it troubles me that you can’t take direct control, as you can in so many other games. 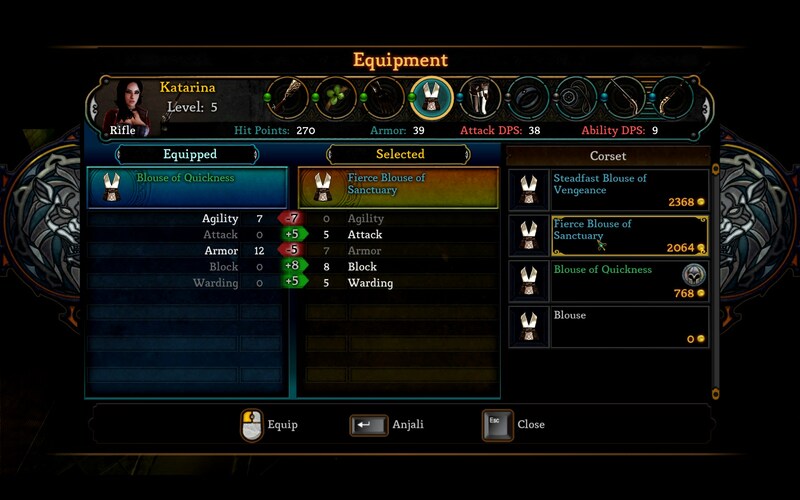 Why do I carefully select abilities and proficiencies and create a play style for this character if I can’t play them directly? There’s no guarantee they’re going to use the things I select in any intelligent way, though to be fair my companion seemed fairly helpful most of the time. The camera is a pain. It’s not wide enough or high enough to let you see enemies before they see you and position yourself right or take a few potshots. Why have a gun if you can only see 20 feet ahead? The camera also likes to jerk around, which of course changes the direction you’re running, since you have to hold the mouse down in the direction you want to go. Oh, sudden 90 degree camera turn! Now you’re running into the wall. And when you run into the wall, the camera likes to zoom so far in that you can’t see a thing, sometimes just floor, sometimes just your character or a nearby enemy. The inventory screen is no fun to navigate. Instead of your character there are just menus with giant icons (many exactly the same or similar) and the standard epithets (Blouse of Quickness, Sword of Conflagration, etc). For something you’ll have to do every minute or two, inventory management is pretty inefficient, and not part of the game, as it has been in so many others. It’s just a list of items. There’s no way to go directly from inventory to, say, quest management. The keyboard shortcuts don’t work. You have to return to the main game screen and then pause again. A loss of mere seconds in the grand scheme of things, but honestly now, this is some really basic menu system stuff. In the first hour I picked up several items that had different names but the same stats. What the hell? You can’t sell stuff you have equipped. Which means you have to leave the store, enter inventory, and unequip, then reenter the store. And if you don’t have any alternate pants, for instance, you can’t unequip. So you have to buy something to change into, then sell the original. I guess that situation isn’t likely to come up, but still. Just let me sell the damn pants. The guns I found didn’t seem to differ much despite wildly different stats. I guess that’s subjective, but to me they looked the same, acted the same, and the only thing that seemed to change was the damage number popping up over the dudes. Where’s the burning on my gun with a fire element? If you’re going to spill the beans early on elemental weapons and such, instead of making them rare, at least make them look and feel different. Are the first ten guns I get more or less indistinguishable gameplay-wise? Don’t make them sound like badass endgame weapons, “Fierce Blunderbuss of Furious Doom” and all that. It’s not fierce, it’s 20% better than the weapon I started the game with. There were some navigation bugs in the store and elsewhere, in which I couldn’t mouse over any items to see what their stats were. There were other miscellaneous interface bugs like that, probably a result of mouse input being a very low priority. The effects of your stats are a bit arcane. You can’t see the effects of things like Will or Retribution without going to your stats screen, which means you have to equip an item, leave your inventory screen, open your character screen, and switch to stats view. If you’re going to talk about things affecting or relying on overall stat scores, why aren’t they right there? The abilities are pretty boring. My special attacks as a cool gunwoman were basically “a big bullet,” “heal over time,” and “area of effect damage.” You can add some effects later, but the abilities/proficiencies/talents just struck me as generic. Granted I only had the patience to play one character type, but I deliberately picked an uncommon type to see some creative play options (not just a swordsman). 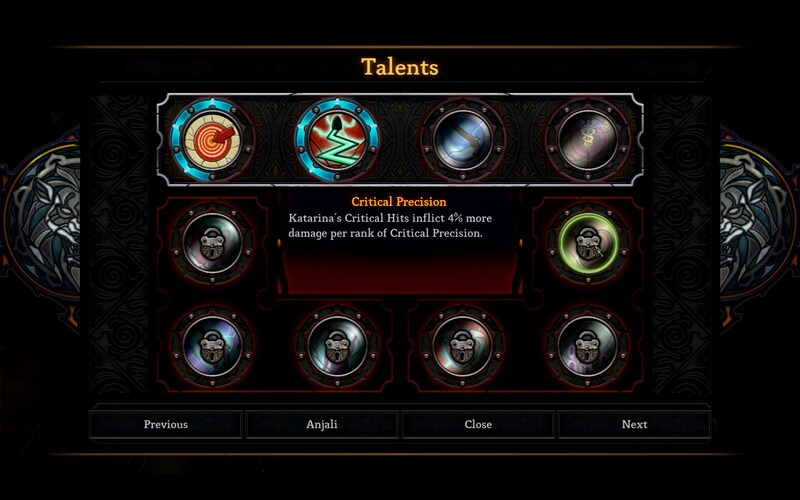 Speaking of abilities, you only have nine. Total! You can “customize” them with proficiencies, but character progression seems incredibly basic, and I couldn’t really get excited about leveling up just to select an extra 4% chance of critical. Sure, there different guys to choose from, but really, nine? You use the same key to block, roll, and activate defensive abilities. So you might be trying to heal yourself and end up diving into the middle of the enemy army. There are save points in every other room, but no autosave or quicksave. And of course you can’t save during combat, because we all know that’s impossible. And you have to activate the save point manually and then select a save slot. Give me a break! If you want to streamline things, why can’t I just walk through it and it updates an autosave? The first boss-monster I encountered (a big fish-man), for a quest gotten in the first town (a quest which had me backtracking already, I should add) killed me in like four hits. Really? I came back forty minutes later with better gear and a pal and killed him, but come on. Why would someone be carrying a big gold candelabra in the middle of the forest? Okay, it’s treasure. Make it a jewel, something logical. The graphics are good, but I was more impressed by the unique visual style of Torchlight than this, which seems to more or less play by the rules, however shiny. So yeah. I realize there may be somewhat more to this game than this, but I’m not really interested in playing. What I’ve played so far makes me want to return it. It’s awkward to control, it clearly was never intended for the PC, and it doesn’t seem to bring anything new to the table. Or if it does, I got bored while they were bringing it. The game might fare better on consoles, but it’s an affront to PC gaming and there are far better experiences available for the discerning hack ‘n slasher on consoles. It shouldn’t have been released like this and in my opinion, the compromises made for console controls just spoil the game; they’ve turned it into a sort of flimsy action RPG with Dungeon Siege flavoring added. It doesn’t stand up to the competition, and it doesn’t stand up to its own kin. If you’re looking for a good action-RPG with loot galore, I highly recommend Torchlight , Sacred 2, and Titan Quest. 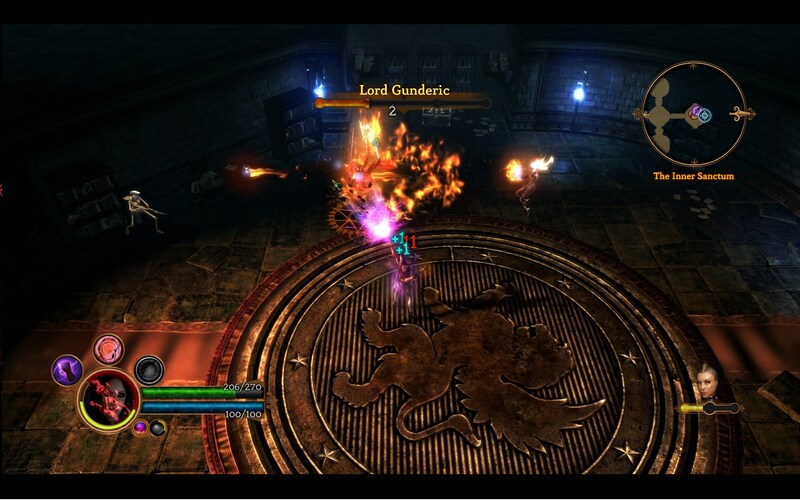 The original Dungeon Siege and Dungeon Siege 2 are also still quite entertaining. You can skip this one.